Anticipation and exhilaration is how one awaits the turn of the year. More parties, more plans and many more resolutions to be made. As the year-ender draws close, many of us will be carefully planning our Christmas breakfast and brunch menus and New Year night’s dinner. 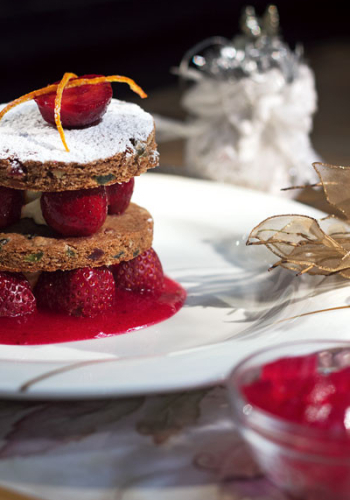 As the festive spell binds us, we watch the evenings spent in chatter and exotic fare extend into the wee hours of morning, spent toying with trolleys of desserts, freshly brewed coffee and that last slice of fluffy cake. Breakfast dates with family quietly slip into day brunches where the entire brigade lounges around the silver tinsel Christmas tree, decorating it with baubles and shiny balls, until late afternoon. As this is generally the festive protocol for most homes in the city. When it comes to entertaining friends and family during Christmas or New Year’s Eve, the rules of food planning, cooking and serving up a handsome-looking smorgasbord have completely changed. Earlier, the norm was to do an early but wholesome breakfast complete with foods such as pecan and honey pancakes, French toast with maple syrup, toast and cherry jam and eggnog before the mass and then settle for a humble lunch. Or, to skip breakfast altogether and spend an entire afternoon wrestling over juicy slices of turkey or lamb chops dressed in light cranberry emulsion, scattered with pistachios and butter-braised beans, post church hours. But with global influences, shared themes and ideas, and even non-Catholic or Christian enthusiasts indulging in X’mas treats, a prolonged breakfast followed by an equally elaborate luncheon has become the norm. Not only are both these meals exotic, they are exquisite and well-thought-out. The same can be said for New Year night’s dinner parties that are meticulously planned by hosts, weeks and months before D-day. “One of the most recent and new-fangled additions to X’mas meals is the introduction of twists to typical Christmas staples,” says Chef Vikas Seth from Bandra-based Nido. According to him, with people constantly looking to innovate and re-create old recipes and give their guests off-beat foods to try, traditional recipes are being served with a twist. This is clearly reflected in the menu that he has planned for the season. Keeping new rules in mind, Chef Seth’s X’mas special menu comprises of dishes such as smoked turkey served on a flat bread, instead of a whole roast, peppered with fig pate, cranberries and parmesan basil dust – ingredients that are generally used in typical festive spreads. Similarly, he has played with dry fruits such as black currants and herbs like sage that are usually used to baste or serve with meat roasts to create a soufflé that is further stuffed into balsamic Portobello mushrooms. A similar spread with twists is also suggested by Chef Kamal Thapa from Pune-based Terttulia’s Mumbai outpost. According to him, “It’s not only to serve something different, but to also challenge yourself. If you have guests who will appreciate classics with a twist, this is the kind of menu you should plan.” He suggests converting a bulky roast into tiny roulades by stuffing it with fruits and other meats. Instead of classic potato salad, how about tossing yours with some rosemary sprinkling and serving crunchy snow peas with cranberry sauce? Chef Thapa recommends doing other filling lunch or brunch-time goodies such as pan-seared Norwegian salmon served with vegetable cous cous and wilted Swiss chard or confit of duck with wheat and lentil pilaf served with asparagus and raspberry sauce. Since berries, duck meat, chard, salmon are popular lunch-table ingredients during Christmas, a new-age menu using this will give out similar flavours but with a difference. Apart from gourmet, a new way of looking at the entertaining menu is to incorporate Indian alternatives. Our country has a rich East Indian, Anglo-Indian and coastal belt where Christmas is celebrated with equal fanfare. “Scoop out recipes of dishes such as mutton tikka Londonwala, Railway mutton curry, poee, kulkul, sanas and other dishes that are filling, wholesome and new for your guests,” says Chef Akhil Rajan from Hilton Shillim Estate Retreat and Spa. According to him, while gourmet food is exciting, these dishes too are rich and offer a new take on what one should serve during Christmas. Keeping this in mind, his Chirstmas menu will introduce regional dishes from other parts of the country along with international dishes to educate diners about what our country already has. Such a menu works wonderfully if your guests appreciate classics and old, forgotten Indian recipes. If you want to experiment with Indian fare yet be unconventional (have the best of both worlds), go for dishes such as poha and sea food paella, wild mushroom kulchas, mustard oil-tempered mashed potatoes, tandoori turkey, shorba shots and other fusion dishes that are a take on typical Indian food mixed with X’mas fare. Such a pairing is not only daring, but exciting and delicious too. When it comes to festive bingeing, the euphoria behind festive treats is at a pinnacle during the dawn of Christmas, until it’s time to get back to work post the pompous NYE. And then comes the withdrawal stage, a mighty vacuum post heavy indulgence. But if you introduce a bit of health on your dinner table from the word go, coming back won’t seem so impossible. Perhaps try a holistic theme for your party with recipes like healthy smoothies, slimming salads, detox main courses, gluten-free desserts and other nutritious additions? We suggest that you do it subtly but surely.